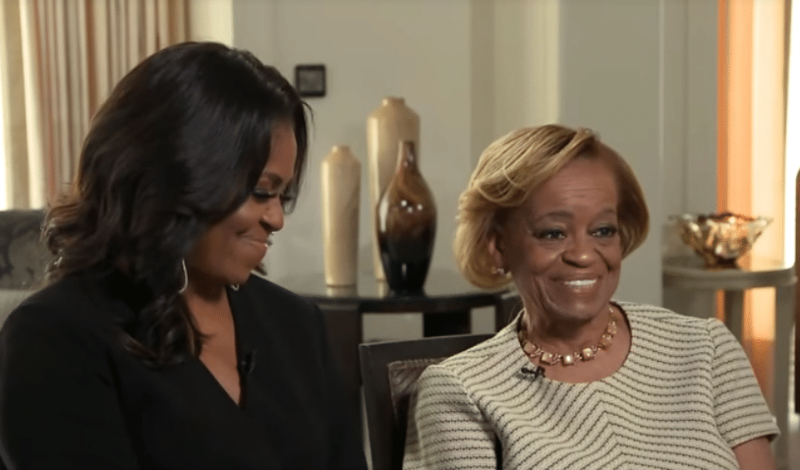 Michelle Obama’s mother, Marian Robinson, gave her very first nationally televised interview on Wednesday morning, finally explaining how it felt to watch her daughter and son-in-law become the most powerful couple in the world. “It’s pretty difficult,” Mrs. Robinson said when CBS This Morning host Gayle King asked how she wrapped her mind around the Obamas becoming America’s first family. During her appearance, Mrs. Robinson also shared why she decided to uproot her life and move to 1600 Pennsylvania Avenue during the Obama administration. The former First Lady echoed her mother’s thoughts, explaining she wanted her mother to be with the family to help instill a sense of normalcy in the lives of her young daughters, Sasha and Malia Obama who were just seven and ten at the beginning of their father’s presidency. While she helped her granddaughters navigate their life in the spotlight, Mrs. Robinson didn’t let living in the White House go to her head. “I talked them into allowing me to do my own laundry,” the 81-year-old said. And she even taught Sasha and Malia how to do their laundry, too. Like her mom, Mrs. Obama doesn’t miss being under the hot glare of criticism levied against those living in the East Wing either. “When I grow up, I would like to be like Michelle Obama,” she said. So would we, Grandma Robinson. So would we.